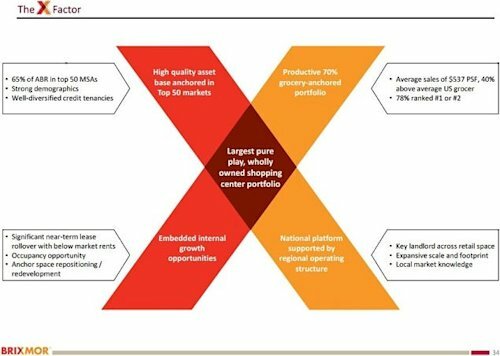 Brixmor Property Group Secondary Offering — Already Baked Into The Cake? There is nothing sinister about The Blackstone Group L.P. (NYSE: BX) reportedly cashing out of 17,500,000 more of its Brixmor Property Group Inc (NYSE: BRX) shares. The Blackstone Group is the largest publicly traded alternative asset manager measured by assets under management (AUM). Blackstone’s global real estate AUM alone are approximately $84 billion, dwarfing its peers when it comes to the commercial real estate asset class. 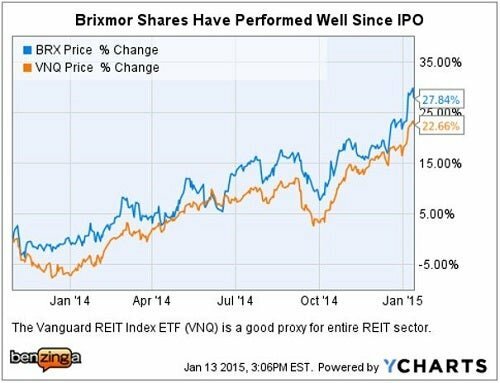 Brixmor was the largest retail REIT IPO since Simon Property Group Inc. raised $840 million in 1993, according to Bloomberg. It is standard practice for Blackstone to remain a majority shareholder after sponsoring an IPO, exiting the majority of its position strategically over the next two to three years. Brixmor — Business As UsualBrixmor owns 558 shopping centers, totaling 87 million square feet, located in the top 50 U.S. metro markets. 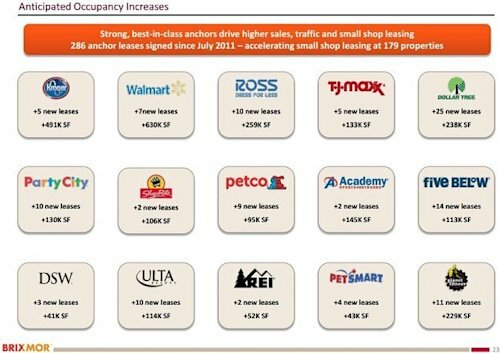 The company is the largest landlord to TJX Companies Inc and Kroger Co.
Blackstone sponsored the Brixmor IPO back in October 2013, and has shared in the success of the almost 30 percent run up in share prices, as entire neighborhood shopping center REIT space has performed well during the past year. Investors should keep in mind that necessity goods and services provided by grocery-anchored community centers are often highly resistant to competition from online retailers. 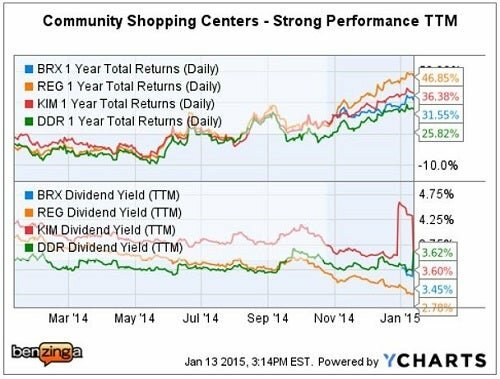 Regency Centers Corp‘s (NYSE: REG) strong relative outperformance during the past year compared to Brixmor and shopping center peers Kimco Realty Corp (NYSE: KIM) and DDR Corp (NYSE: DDR) has caused its dividend to dip below a 3 percent yield. The Blackstone real estate mantra has been “Buy It, Fix It, Sell It.” Blackstone fine-tuned the shopping center portfolio it acquired in 2011 from Australia’s Centro Properties Ltd. It sold some centers and purchased others from Equity One, Inc. and Regency Centers Corp.
By the time Blackstone sponsored the Brixmor IPO, portfolio occupancy was at 92 percent, reflecting 10 consecutive quarters of improvement. 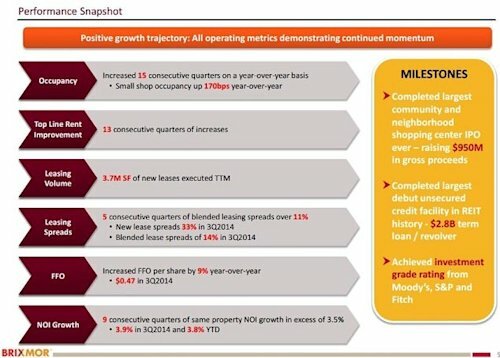 This low 90s occupancy level still left plenty of room for NOI upside, as illustrated by this slide from Brixmor’s Q3 2014 Presentation. Notably, average base rent per square foot (ABR/SF) on new leases has increased to $20.35, significantly above Brixmor in-place ABR/SF of $12.10. Raising The BarShareholders investing alongside Blackstone have been beneficiaries of Brixmor’s ongoing “Raise the Bar” campaign begun in July 2011 to upgrade its centers. The company reported that 179 properties have already been upgraded and remerchandised, with 160 additional opportunities in the pipeline. After the secondary stock offering is completed, Blackstone will no longer be the majority shareholder in Brixmor Property Group and will voluntarily give up one of its seats on the board of directors. However, Blackstone will still have significant skin in the game. This share “overhang” means that there will be other secondary offerings in the future. On the other hand, it also means that Brixmor shareholders interests continue to be aligned with its IPO sponsor, Blackstone — arguably one of the world’s premier real estate asset managers.